In 1998, the first orofacial cleft (OFC) patient was referred to the Orthodontic Clinic of the University of Ghana School of Medicine and Dentistry for an orthodontic consultation, and in 2003, a multidisciplinary clinic at the associated hospital, Korle-Bu Teaching Hospital (KBTH) was inaugurated and partnered by the nongovernmental organization (NGO), Transforming Faces (TF) with the catchment area of the Greater Accra, Central, and Volta regions from 2003 to 2014. The NGO Smile Train replaced TF from 2014 to date. The aims and objectives of this study were to document and determine presentations, frequencies, management strategies, and associated care influences of OFC clients referred to this orthodontic clinic over a 30-year period to influence quality improvement policy. The compiled data that were reviewed for this retrospective study were obtained from patient records entered from 1998 to 2018 at the Orthodontic clinic of the University of Ghana School of Medicine and Dentistry. The information collected included demographic features, the chief concerns of the client/caregiver, the type of OFC condition, the source of funding or payment for care, and the type of appliance used for the clients in which treatment was instituted. The OFC categories used were cleft lip (CL) only, cleft palate (CP) only, unilateral CL and palate (UCLP), and bilateral CL and palate (BCLP). Data were analyzed and the results displayed in tables and graphs using Microsoft Excel. Over the 20-year study period, 34 individuals were referred to the orthodontic clinic. The highest number of patients was referred during the first half of the year 2018 (n = 6). 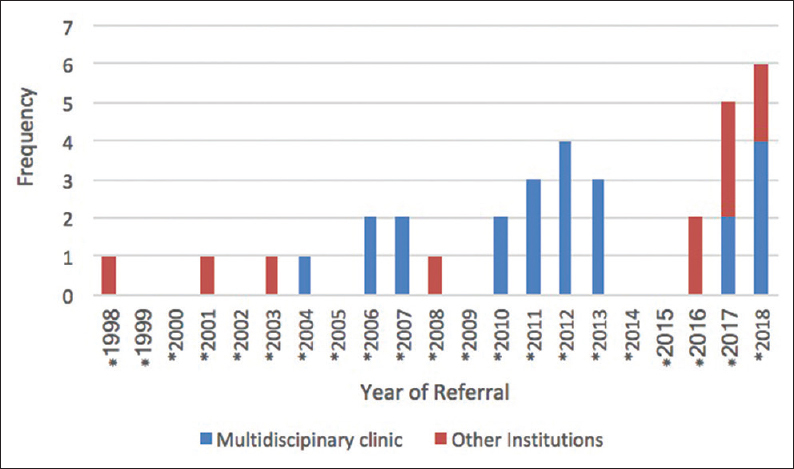 After 2003, when the multidisciplinary OFC clinic was inaugurated, patients were referred every year except during the years 2005, 2009, 2014, and 2015 [Figure 1]. Of the total of 34 clients referred to the Orthodontic Clinic during the 20-year period (1998–2018) included in this review, the majority of clients (n = 23, 67.65%) was referred from the KBTH multidisciplinary clinic. A smaller number (n = 11, 32.35%) was referred from other hospitals and clinics [Figure 1]. 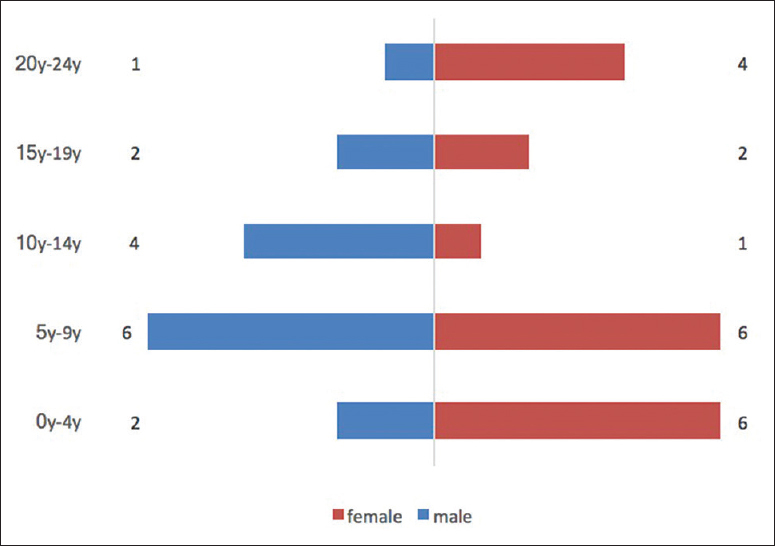 Of the 34 identified clients, there was a slightly smaller proportion of males (n = 15, 44%), than females (n = 19, 56%). The ages of the clients referred to the clinic ranged from 2 weeks old to 20 years old. The majority of the referred clients were in the 5–9-year-old age group (n = 12, 35.29%), and the least were in the 15–19-year-old age group (n = 4, 11.76%) [Figure 2]. Of the total number of clients referred (n = 34), the majority of the clients were classified as UCLP (n = 16, 47.06%). The least number of referrals was for clients with only a CL (n = 4, 11.76%). 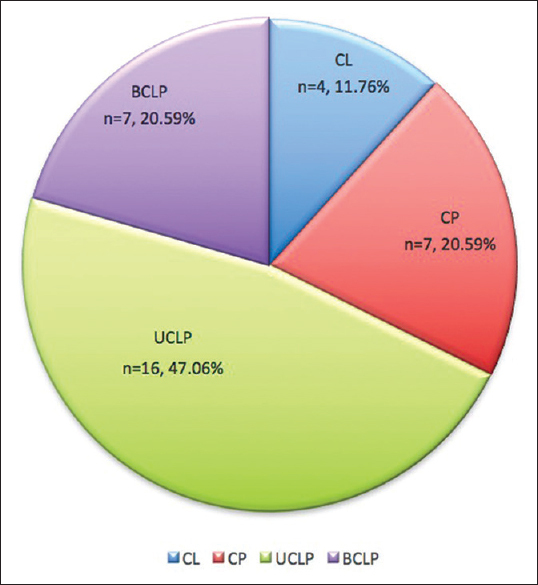 Clients in the CP-only group and the BCLP were of equal numbers of (n = 7, 20.59%) each [Figure 3]. 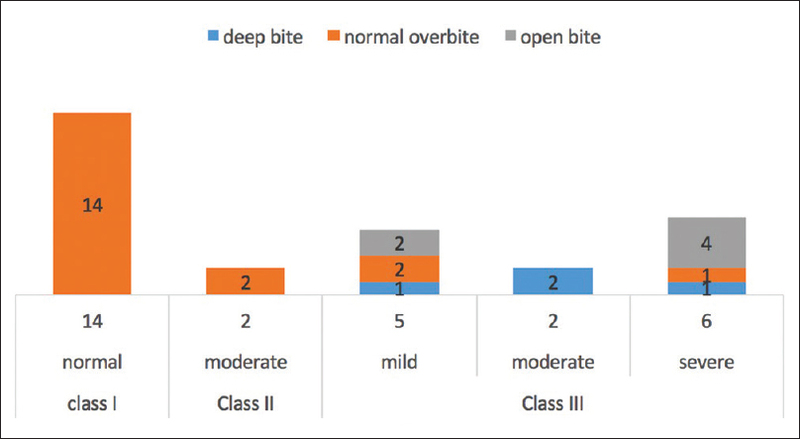 Frequency of OFC patients by orthodontic classification Of the patients that had adequate eruption of incisors so that orthodontic incisor classification could be determined (n=29), majority (n=14, 48.27%) were classified as Class I with normal overbite followed closely by Class III (n=13, 44.83%). The least number were recorded in the Class II category (n=2, 6.90%) [Figure 4]. The most common chief concern of the patients and their caregivers was the crowding and malalignment of teeth (n = 17, 50%). This was followed by the “do not know” category (n = 5, 14.71%). 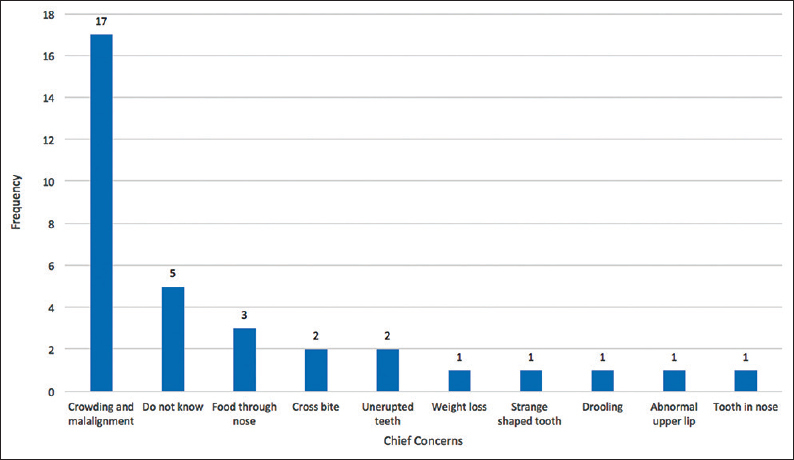 More functional concerns, including “food through nose” (n = 3, 8.82%), “drooling” (n = 1, 2.94%), and weight loss (n = 1, 2.94%), were less of a concern [Figure 5]. Of the patients who underwent treatment (n = 26), the majority were treated using fixed upper-only appliances (FU) (n = 10, 38.46%). This was followed by fixed both upper and lower appliances (FUL) (n = 5, 19.23%). Obturators were used in only (n = 4, 15.38%) of the cases and the delivery of a denture only in the fewest number of cases (n = 1, 3.85%). The use of upper removable appliances counted for only (n = 2, 7.69%) as did the treatment by extraction only and composite recontouring only [Figure 6]. Six patients were contemplating treatment, and treatment was considered too early in two patients. Of the 26 who were treated, the least common source of funding was employee insurance (n = 2, 5.88%). The most common means of payment was “out-of-pocket fees” (self-funded) (n = 17, 50.00%), which was followed by pro bono (free) funding (n = 7, 20.59%). 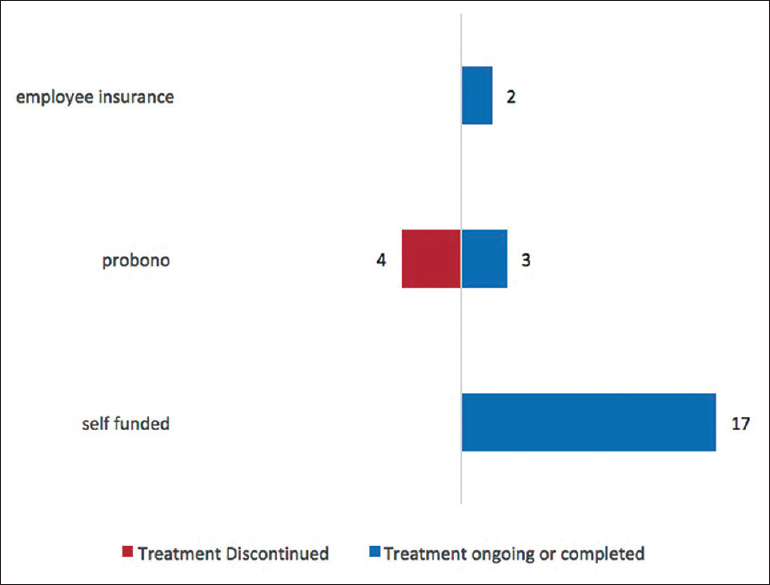 In all, 57.14% of the pro bono cases discontinued treatment, whereas neither of the self-funded patients (that paid “out-of-pocket” fees) nor employee insurance funded was lost from care [Figure 7]. OFC is a congenital defect that occurs worldwide. The highest reported OFC prevalence rates are in Native Americans and Asians (0.82/1000–4.04/1000). In Africa, some studies report high prevalence rates,, compared to others that report low prevalence rates as 0.3/1000 reported in Nigeria. These low prevalence and incidence rates have been suggested to be due to the high infant mortality rate and the unreported infanticide of newborns with OFCs., The reported prevalence of OFC is relatively low in the Ghanaian population. Agbenorku et al. reported an incidence of 1.31/1000 live births in 27,449 births in 11 selected health facilities in Kumasi, Ghana. However, they also reported an exceptionally high prevalence of at least 6.3/1000 people in the Wudoaba Community in Southeast Ghana. Individuals with OFC present with a multiplicity of physical and clinical challenges and effective management of these conditions requires care provision from health personnel in varied fields of specialization. This multidisciplinary specialist model is internationally accepted, and many centers have begun to develop services in alignment with this model to enable management that begins before birth and continues into late adulthood under one multidisciplinary team. The adverse impact of OFC on infants born with this condition, their families, and the communities into which they are born is immense. These babies are believed to bring misfortune and stigmatization to the family, and this may lead to infanticide or abandonment of the affected child by its parents.,, In some communities, mothers are held responsible for birth defects and are therefore ostracized from their villages. Culturally, in Ghana, newborns are welcomed into the family during an “Outdooring” ceremony on the 7th day after birth. During this ceremony, they are given a family name. However, the families of babies with OFC tend to be too embarrassed by the affected baby's appearance to hold this naming and outdooring ceremony, and the unfortunate child, therefore, remains unnamed. In addition to the humiliation caused by their discomfiting facial appearance, affected children often have nasal speech, which may prevent them from attending school. A previous report described one community's solution to this problem, which involved having these individuals operate a night market that was poorly lit by kerosene lamps so that their defect could be more easily concealed. In the past, cleft surgeries were carried out by a variety of surgeons, especially general pediatric surgeons, otolaryngologists, and oral surgeons but were poorly documented. In newborns with OFC in Ghana, the clinical priorities involve reassuring the parents of the noninvolvement of witchcraft, that treatment is available and ensuring the newborn's immediate survival by managing feeding difficulties. Surgeries can subsequently be performed to correct the lip at about 10 weeks old and the palate at 6–12 months old. Interventions by speech pathologists, otolaryngologists, pediatric dentists, and orthodontists depending on their availability are begun at a later date. The KBTH is situated in the capital city of Ghana, Accra, and was initially commissioned by the colonial government in 1923 as a 200-bed hospital. It was expanded in the early 1960s to form the 2000-bed premier Teaching Hospital of Ghana, which is the largest hospital in Sub-Saharan Africa. It remains a major tertiary referral center for the entire West African region. Its OFC multidisciplinary team consists of plastic surgeons, dental surgeons, orthodontists, speech therapists, anesthetists, a clinical psychologist, pediatricians, otolaryngologists, nutritionists, and both community health and clinical nurses. There is no specialist in orthognathic surgery. This team undertakes outreach programs to identify new patients, educate the public regarding the availability of treatment for prospective patients, and to reduce the stigmatization of affected individuals. At the monthly multidisciplinary clinic, patients are examined, treatment plans are formulated, and appointments are made for surgeries which are performed by plastic surgeons. At these clinics, referrals are also made to specific centers where a variety of other specialists can continue their expert management of these cases. The majority of OFC patients in whom orthodontic treatment is recommended are referred from this multidisciplinary Clinic to the Orthodontic clinic of the University of Ghana School of Medicine and Dentistry. A smaller number are referred from other hospitals and clinics of the catchment area Greater Accra, Volta, and Central regions of the country. The remaining regions are the catchment area for the second cleft care center in Ghana, the Komfo Anokye Teaching Hospital (KATH) which is situated in Kumasi, 202 Km north of Accra. After the KBTH multidisciplinary clinic was introduced in 2003, the yearly rate of referral to the orthodontic clinic gradually increased from one client per year to the highest rate of referral (six per year), which was observed during the first half of 2018. Due to human resource difficulties, zero referrals were recorded for the years 2005, 2009, 2014, and 2015. The steady increase realized from 2016 to 2018 is likely the result of the appointment of the country's first consultant pedodontist. Since the overwhelming majority of cases (n = 23, 67.65%) were referred from the KBTH multidisciplinary clinic, its introduction is likely responsible for the increase in orthodontic referrals. This multidisciplinary approach for this condition ensures that patients requiring orthodontic care are referred for this specialized care on a timely basis. The overall low referral rate to the Orthodontic Clinic from other centers outside of KBTH (n = 11, 32.35%), however, could be the result of several factors, including difficulty in long-term patient follow-up and compliance as observed by authors in two cities in Nigeria. Another factor would be the ignorance of orthodontics and its contribution to health by healthcare personnel. In a study of knowledge of orthodontics among medical students in Ghana, only 32.1% of the medical students correctly identified the functions of an orthodontist. Similar findings were reported in Nigeria and Saudi Arabia. Other factors that could affect the low referral for orthodontic care include treatment “burnout” and the reluctance of patients to return for follow-up treatment as teeth erupt and malocclusions become evident. This reluctance of patients to return for follow-up treatment was considered the main cause of the decrease observed in palatal surgeries in the Komfo Anokye Teaching Hospital study. Additional factors include the limited availability of orthodontic specialists, the lack of National Health Insurance Scheme (NHIS) funding for orthodontic treatment, associated severe limitations on funding for dental treatment, and the relatively long period of time and relatively numerous number of appointments required to complete orthodontic treatment as compared to the primary surgeries for OFCs. Improvement of referral rates from other health institutions would involve public and health professional education, encouragement from people who have had orthodontic treatment, and improved awareness of the availability of orthodontic treatment and its acceptance. The results of our study indicate that there was a slightly higher proportion of females (52.2% n = 12) [Figure 1] than males (47.8%, n = 11) referred for orthodontic treatment. However, other studies have reported that more males are affected. For example, in a 5-year study by Donkor et al. that was performed in the central part of Ghana, the participants (n = 344) were 58% male and 42% female. A similar result was found in a later study performed by Agbenorku et al. in the same hospital and in other studies.,, However, other studies performed in Africa, including Malawi and Sudan, have reported a female predominance. A potential explanation for our finding of female over male predominance in patients who presented for orthodontic referrals, in contrast to the findings reported in the Kumasi studies, of patients who present for primary repair surgery, is that females may be more conscious of their appearance and therefore more inclined to seek orthodontic treatment than their male counterparts. The majority of patients who were referred to the Orthodontic Clinic were in the 5–9-year-old range. A similar finding was reported in the Kumasi-based study, in which the majority of patients who underwent surgery were 4–7-year old. The finding that the majority of referred patients fell in this age range may be because this is the mixed dentition period, which is the phase during which the permanent teeth erupt. Hence, the malalignment of teeth associated with the OFC would become more apparent. Children also start regular school at age 6, when their unfortunate facial appearance and the eruption of malaligned teeth could cause them to be subjected to teasing by their peers making them more inclined to seek treatment. The first resident consultant orthodontist in Ghana introduced the use of fixed braces to the country in 1995. The public considered braces very unsightly and expensive, and patients therefore needed to be persuaded into accepting fixed orthodontic treatment. As the maxilla was the site of principal concern and abnormality, a compromised treatment plan that consisted of fixed upper appliances only (FU) was selected and implemented. In addition, FU was less expensive than a fixed treatment involving both jaws (FUL). Hence, more patients chose (FU) (n = 10, 38.46%) over (FUL) (n = 5, 19.23%). Only (n = 4, 15.38%) had obturators delivered. They were not routinely recommended to aid feeding following birth because it was anticipated that the mothers would find them difficult to keep clean, which would predispose the affected newborn to infections, such as diarrheal diseases. In contrast to the NHIS which does not fund orthodontic treatment and provides only limited funding for general dental care in OFC patients, the NGOs, Transforming Faces and Smile Train, and funded free or highly subsidized surgeries, which were provided by local surgeons. Other charitable organizations and benefactors were expected to play a significant role in sponsoring OFC client orthodontic treatment because it is such a particularly disfiguring and conspicuous abnormality, but no patient admitted to such funding. The NHIS does not fund Orthodontic care and provides only limited funding for the primary surgery and general dental treatment. The highest proportion of orthodontically treated OFC patients (n = 17, 65.38%) paid “out-of-pocket” fees for orthodontic treatment and the next largest group (n = 7, 26.92%) consisted of pro bono cases. Funding was, therefore, limited and hence the less expensive “upper-only braces” (FU) option was largely used to treat patients [Figure 8]. More than half of the patients who received pro bono treatment discontinued treatment (n = 4, 57.14%), which points to the urgent need for more stringent criteria for selection of such patients and the inclusion of counseling in management to ensure readiness. The reason for the number of patients not returning for treatment after consultation, i.e., clients contemplating treatment (n = 6, 17.65%) may be a financial barrier. The NHIS could consider, including OFC care, as one of the conditions whose complete management is supported to improve uptake of care. Furthermore, to stress upon this point, several authors have recommended that to improve upon African cleft care in general,, there is the need for increased funding which again in Ghana, could be realized by the inclusion of complete OFC care in the NHIS. At present, in Ghana, there is one consultant pediatric dentist and two pediatric dentistry residents in training. In addition, there are six consultant orthodontists and approximately ten orthodontic residents in training for a population of 29 million. The introduction of the OFC multidisciplinary clinic was most beneficial as it was a major referral source for the University of Ghana School of Medicine and Dentistry orthodontic clinic. Health professional and public education is still needed to increase referral rates from other institutions. To address the notable loss from the care of pro bono cases, more stringent criteria for selection of these cases are needed in addition to tailored counseling to ensure patients are adequately prepared and ready to complete treatment. Given that financial barriers may also be a cause for the low uptake of orthodontic care and use of the less expensive “upper-only braces” (FU) compromise treatment option, the inclusion of complete OFC care in the NHIS could improve the situation. The authors would like to thank Dr. Thomas Ndanu for his help with the statistical analysis. The corresponding author gratefully acknowledges the support of the University of Ghana Conference Grant Scheme in the form of an International Travel Grant to present this paper at the 2017 International Cleft Conference in Chennai, India. McLeod NM, Urioste ML, Saeed NR. Birth prevalence of cleft lip and palate in Sucre, Bolivia. Cleft Palate Craniofac J 2004;41:195-8. Khan AA. Congenital malformations in African neonates in Nairobi. J Trop Med Hyg 1965;68:272-4. Simpkiss M, Lowe A. Congenital abnormalities in the African newborn. Arch Dis Child 1961;36:404-6. Gupta B. Indicence of congenital malformations in Nigerian children. West Afr Med J Niger Pract 1969;18:22-7. Iregbulem LM. The incidence of cleft lip and palate in Nigeria. Cleft Palate J 1982;19:201-5. Ogle OE. Incidence of cleft lip and palate in a newborn Zairian sample. Cleft Palate Craniofac J 1993;30:250-1. Agbenorku P, Yore M, Danso KA, Turpin C. Incidence of orofacial clefts in Kumasi, Ghana. ISRN Plast Surg 2013;2013:280903. Agbenorku P, Agbenorku M, Iddi A, Abude F, Sefenu R, Matondo P, et al. A study of cleft lip/palate in a community in the South East of Ghana. Eur J Plast Surg 2011;34:267-72. Hodgkinson PD, Brown S, Duncan D, Grant C, McNaughton A, Thomas P, et al. Management of children with cleft lip and palate: A review describing the application of multidisciplinary team working in this condition based upon the experiences of a regional cleft lip and palate center in the United Kingdom. Fetal Matern Med Rev 2005;16:11-27. Nwoku AL. Experience on repair of unoperated cleft patients. Niger Med J 1974;6:417-21. Donkor P, Bankas DO, Agbenorku P, Plange-Rhule G, Ansah SK. Cleft lip and palate surgery in Kumasi, Ghana: 2001-2005. J Craniofac Surg 2007;18:1376-9. Olasoji HO, Ugboko VI, Arotiba GT. Cultural and religious components in Nigerian parents' perceptions of the aetiology of cleft lip and palate: Implications for treatment and rehabilitation. Br J Oral Maxillofac Surg 2007;45:302-5. Adeyemo WL, James O, Butali A. Cleft lip and palate: Parental experiences of stigma, discrimination, and social/structural inequalities. Ann Maxillofac Surg 2016;6:195-203. Akinmoladun VI, Owotade FJ, Afolabi AO. Bilateral transverse facial cleft as an isolated deformity: Case report. Ann Afr Med 2007;6:39-40. Penn C, Watermeyer J, MacDonald C, Moabelo C. Grandmothers as gems of genetic wisdom: Exploring South African traditional beliefs about the causes of childhood genetic disorders. J Genet Couns 2010;19:9-21. Oginni FO, Asuku ME, Oladele AO, Obuekwe ON, Nnabuko RE. Knowledge and cultural beliefs about the etiology and management of orofacial clefts in Nigeria's major ethnic groups. Cleft Palate Craniofac J 2010;47:327-34. Acheampong Oti A, Obiri-Yeboah S, Newman MA, Donkor P. Speech and language development; a major challenge among repaired cleft lip and palate patients at a multidisciplinary cleft center in Kumasi, Ghana. Ghana Dent J 2017;14:5-7. Agbenorku P, Agbenorku M, Sefenu R, Matondo P, Osei D. Endemicity of cleft lip/palate in a rural community in South-East Ghana. J Sci Technol 2007;27:45-50. Newman MA, Agbenorku P. The status of orofacial cleft care in Ghana. Oral Health Dent Manag 2014;13:45-8. Distance from Kumasi to Accra. Available from: https://www.distancefromto.net. [Last accessed on 2018 Mar 07]. Onah II, Opara KO, Olaitan PB, Ogbonnaya IS. Cleft lip and palate repair: The experience from two West African sub-regional centres. J Plast Reconstr Aesthet Surg 2008;61:879-82. Newman-Nartey MA, Osei–Tutu K, Ogubanjo BO, Adegbite KO. Awareness and Knowledge of Orthodontics as a Specialty of Dentistry amongst students of the University of Ghana Medical School. West Afr J Orthodon 2013;2:30-4. Adegbite K, Ogunbanjo B, Ajisafe O, Adeniyi A. 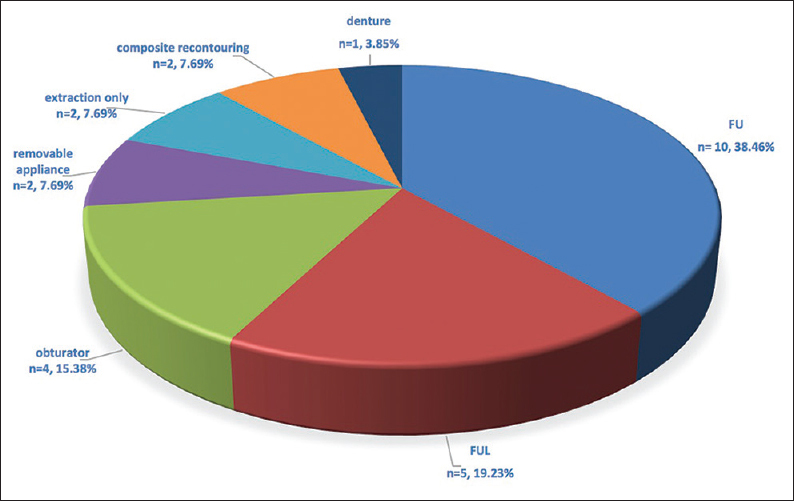 Knowledge of orthodontics as a dental specialty: A preliminary survey among LASUCOM students. Ann Med Health Sci Res 2012;2:14-8. Al Shahrani I, Kandyala R. Medical students' awareness of orthodontics: A cross sectional study in King Khalid University, Abha, Saudi Arabia. Arch Orofac Sci 2014;9:17-24. Agbenorku P, Ansah S, Acheampong A, Sabbah D, Bankas D, Adu E, et al. Komfo anokye teaching hospital multidisciplinary cleft clinic. J Craniofac Surg 2011;22:532-6. Jensen BL, Kreiborg S, Dahl E, Fogh-Andersen P. Cleft lip and palate in Denmark, 1976-1981: Epidemiology, variability, and early somatic development. Cleft Palate J 1988;25:258-69. Gregg T, Boyd D, Richardson A. The incidence of cleft lip and palate in Northern Ireland from 1980-1990. Br J Orthod 1994;21:387-92. Lees M. Genetics of cleft lip and palate. In: Watson AC, Sell DA, Grunwell P, editors. Management of Cleft Lip and Palate. London: Whurr Publishers; 2001. p. 87-104. Msamati BC, Igbigbi PS, Chisi JE. The incidence of cleft lip, cleft palate, hydrocephalus and spina bifida at Queen Elizabeth central hospital, Blantyre, Malawi. Cent Afr J Med 2000;46:292-6. Suleiman AM, Hamzah ST, Abusalab MA, Samaan KT. Prevalence of cleft lip and palate in a hospital-based population in the Sudan. Int J Paediatr Dent 2005;15:185-9. Moller P. Cleft lip and cleft palate in Iceland. Arch Oral Biol 1965;10:407-20. Hixon EH. A study of the incidence of cleft lip and cleft palate in Ontario. Can J Public Health 1951;42:508-11. Obuekwe O, Akapata O. Pattern of cleft lip and palate [corrected] in Benin City, Nigeria. Cent Afr J Med 2004;50:65-9. Mossey P. Global strategies to reduce the healthcare burden of craniofacial anomalies. Br Dent J 2003;195:613. Population of Ghana. Available from: http://www.countrymeters.info/en/Ghana. [Last accessed on 2018 Mar 11].